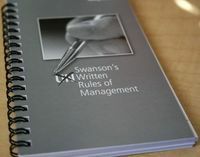 Den åttonde lagen i Swanson’s ”Unwritten rules of management” handlar om att hur triviala och meningslösa dina tidiga uppgifter är, gör ditt absolut bästa för att lösa dem. Din namnteckning kommer för alltid vara kopplad till dessa uppgifter och du kan bara tjäna på att skapa bra relationer med dina närmsta chefer. It is important to set high standards for your career and to be demanding of yourself – to want to perform challenging tasks well. howerver, you are more likely to be given the opportunity to take on complicated , difficult assignments, if you first demonstrate htat you are willin and able to perform simpler tasks well. You will be surprised how much your performance may be recognized if you execute even a mundane task with a little pizzazz. Conversly, if, you eraly in your career, you act as if the simples assignments are beneath you, then your manager may feel you are challenging his or her judgement and your peers may feel you are not a team player. Building strong relationships with management and peers early in your career will help you immeasurably later on. Everything you do, no matter how menial or trivial it may seem, has your name associated with it. For that reason alone it is worth doing well. Remember that if your manages is good, he or she will always be trying to develop the talent – you. When you are a manager, you will want to do the same.